A villa in a stunning location, relaxing and comfortable, with 2 acres of land and garden, private but not isolated. 10x5m pool (floodlit at night) with sole use, sun terraces, barbecue, equipped and furnished to a high standard, parking for 3 cars; 2km from Thenon a small market town with all major facilities, . 10 minutes from Lascaux caves and Montignac, close to Vézère and Dordogne areas. Surrounded by vineyards and pine forests with lots of lovely walks.' The house is available all year round. 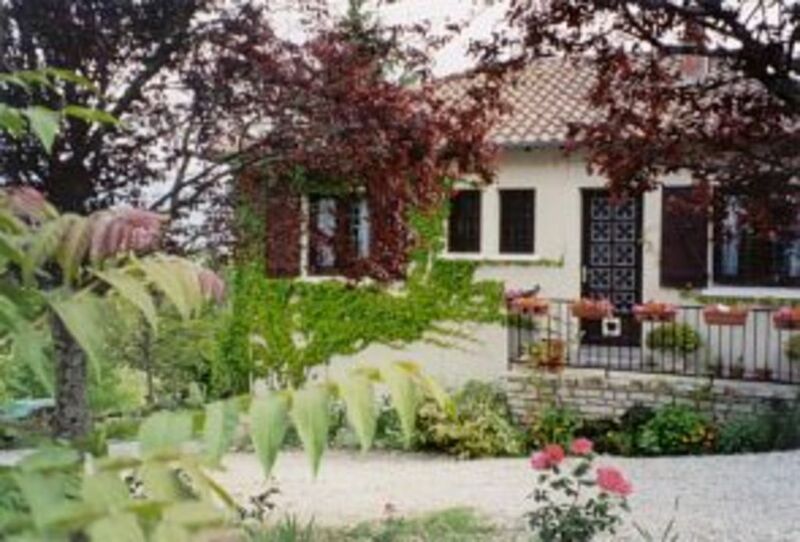 The villa is ideal for the discovery of Perigord Noir, the area of the Dordogne in which it is located. An area of beautiful scenery it is also the land of '1000 châteaux', steeped in history and prehistory with caves full of engravings and paintings. It is also a haven for wild life including many species of orchids, birds and butterflies, and the villa though within easy reach of all major tourist attractions is off the main tourist routes and set high above a valley, quiet and secluded. The main balcony and poolside terraces are sun traps and in the summer a warm and sunny from dawn to dusk. There is alfresco eating at the picnic bench in the garden, and on the terrace. Outdoor barbecue, loungers and parasols provided. There is ample parking for up to three cars and the villa and the site are airy light and not cramped. A vineyard borders one side of the property and a small quiet road runs into the forest and the outlying hamlets. The villa is in the country but yet in easy reach of shops banks and restaurants. NB Due to the stair from the balcony to ground level, we would advise that possible our property may not be suitable for families with very small children. Eating in Perigord Noir is a gourmet's delight and there are many fine restaurants nearby as well as those which offer good meals at budget prices. Perigueux and Sarlat the two nearest big towns have splendid medieval centres, International Mime and Theatre festivals, and Montignac, 12 minutes away, has a world famous international dance festival at the end of July. The house and the region offer the opportunity to relax in lovely surroundings and comfort with all the pleasures of quality tourist attractions if required, close at hand. In the main house, separate toilet and shower room with washbasin. The studio downstairs has its own toilet, shower and basin. CD player plus video player with a large selection of films for all interests and ages are available The satellite TV is free view and includes UK terrestrial TV/radio channels. Due to the speapness of the outside stairs from the balcony our house may not be suitable for very young children or wheelchairs as it is set on three levels with steps between each. The house is a non smoking property. Beautiful location with stunning scenery. We had a lovely stay for a family get together. The house was well equipped with good sized rooms. The pool was absolutely amazing and used non-stop throughout our stay. We too had deer visiting on a couple of evenings and the addition of all the games made for a very fun week. Thank you Rachel for your feedback, we are happy you all enjoyed your stay. Really enjoyed our 10 days holiday. The house had everything we could need. Particular highlight was the pool which we used every day. Appreciated the thoughtful touches like provision of pool inflatables, games, DVDs, washing powder, bottle of wine and cakes on arrival. The house was quite hot when we arrived as the shutters had been left open but after a few days of keeping them closed and using the fans and sun umbrella on the terrace it was more manageable. Owners were very easy to contact throughout, and helpful when we needed advice about a power cut following a storm. Thenon itself has perhaps seen better days and is a bit out of the main tourist areas, 2 out of 3 boulangeries were permanently shut and the 3rd only opened for the last few days of our holiday but was very good. There's a Carrefour and a good pizza take away. We also went for dinner at the lakeside cafe which had a nice atmosphere. Nearby summer evening market at Aurignac on a Thursday also a lovely atmosphere for supper. 10 mins to Montignac which is a bit bigger and has some tourist attractions and half an hour to Sarlat. Thanks for a very relaxing holiday. The photos do no do this property justice. Its a true french home. My daughter(12) and her friend enjoyed staying in the studio together and gave them their space. The pool is amazing, the house had everything you needed. There were different areas to eat inside and out and we enjoyed the BBQs on the terrace. The house felt very secure and quiet apart from a few neighbouring dogs but they were friendly enough. The first morning here we spotted 4 deer in the garden who came back during the stay. Within 1 hours drive in any direction and there is plenty to visit and see. There are a number of large supermarkets at Terrason but the local one in Thenon has most things you need. LeClerc in Terrason only takes cash so be aware. We were recommended the restaruant by the lake, it was basic but very nice and cheap. Max the property manager was very helpful and too hand. There are bikes , games, books, DVD everything you need, and the owners allow for the use of art materials, the girls and myself enjoyed trying them out. (I have even bought some when I got home a hobby I used too have, now re-energised.) Thank you so much for letting us stay in your home it was a perfect holiday. There were only 2 issues which we highlighted but didn't spoil our stay, the internet went down and there was a small leak in the bathroom of the studio. We would recommend this to anyone and have done, and are looking to possibly return next year to carry on exploring the area a perfect spot. Thank you so much for your charming review We are so glad you enjoyed your holiday. Welcoming home in a fantastic setting. We have just returned from a thoroughly enjoyable and relaxing holiday at this property. The owners were extremely friendly and helpful beforehand and gave us several routes to take. On arrival the property was very picturesque and welcoming. The photographs do not do it justice. It is lovely and the views are magnificent. The property was like a tardis. The bedrooms were really nice and the pool was much larger than we expected and well used by us. Max who manages the property was very helpful and cleaned the pool twice each week. There are many fruit trees and we were lucky to have several visits from a deer during our two weeks who seemed to be enjoying the fruit also. The painting materials were enjoyed by our daughter and the table tennis by all of us. The house book was a nice touch and informative. The barbecue was used every day and we enjoyed meals on all three levels. There are plenty of seating area's dotted around. It is well placed for sightseeing and along with swimming and sunbathing we managed visits to Domme, Belves, Perigeaux, several trips to Monignac. We also went canoeing. We would recommend this property and would stay there again. We loved it. We are so happy you all enjoyed your holiday. Overall the holiday was fantastic. Extremely Relaxing if you just want to get away from it all. Weather was very good all week with warm evenings. Amazing views from the verander overlooking the valley, the hills and onto the pool area. House is very well equipped with plenty to do so will never get bored. Plenty of games, activities and table tennis in the cellar area. Television with english speaking channels if all else fails. The pool area is delightful and tranquil. Sun trap with sun all day long. Sun Loungers and chairs available. Peaceful very big plot of land and garden to play games in or just to relax. Local shoppi very well stocked with all needs covered. Pleasent walks or bike rides (house has 3 bikes in garage). Montignac has a few nice bars along the river for an enjoyable drink. Sarlat is another town about 20-30km away with a brilliant Saturday Market. Overall i would thoroughly recommend this little treasure of a house as a must see as i will be to friends and family. Overall this Villa is a great place for a holiday in a lovely area of the Dordogne, close to all the main places one would want to visit. It is well equiped and comfortable. The Villa pool is great, a good size for the property. The villa itself could do with a bit of TLC and with a small outlay this could be 1st class. One shower room for 3 bedrooms (a possible 6 people) is not enough - the studio needs its own shower or bath, as there is plenty of room. It also needs better ventilation as the extractor fan did not work and it was a bit wiffy to start with. The BBQ was rusted and dirty and the terrace chairs and garden benches were not comfortable and the latter were on the verge of collapse. The lock on the front door needs replacing as it takes 10 mins to lock the door when you leave -its simply not good enough to say it is quirky- it is broken! These are all small quibbles but if they had been dealt with, this would have been perfect. I would certainly recommend this villa to others if the small details were fixed and I would be happy to return. Thenon is a small traditional market town on the edge of Vézère Valley with its famous prehistoric sides. The countryside is green with steep sided wooded valleys, and rivers winding through limestone cliffs. Ancient chateau, picturesque villages and medieval towns are everywhere. This is an ideal area for walking, swimming, canoing and sightseeing. There are two golf courses nearby, Perigeux and Brive. Enjoying the fine food, pavement cafés, and basking in the sun, are pleasant and less strenous activities on offer. Thenon with its weekly market also has a range of restaurants and bars, a supermarket, a plan d'eau for fishing and boating and a forest challenge activity park with tree top walks and abseiling . All the major tourist sites of the Dordogne Valley are within easy driving distance, but the house itself is i quiet and peaceful, comfortable and welcoming. A deposit ID required on booking and an indemnity payment with the balance which is returned if the property is left in good order at the end of the booking Please note 30% deposit required to secure your booking Special offers available. We are happy to accept, Euros, dollars and English Pounds.